Wow! H�kan I think your backdrop looks beautiful! For someone who is just starting out doing this kind of thing,it looks very professional! Just Please! Don't cut your ear off and send it to me as a thank you. I think it's looking beautiful too. Quite spectacular even. Yes, indeed, a daring and successful backdrop painting effort! Beautiful. it is strange, when painting and messing about it looks awful but after a couple of days it looks much better. I guess perspective is much depending on the viewers height in relation to the real 3D model railroad. The lake won't work when taking photos at track level I think. I guess perspective is much depending on the viewers height in relation to the real 3D model railroad. The lake won't work when taking photos at track level I think. Which is why one should always avoid having a horizon or something depicted in perspective (other that the distance/size relationship) in a backdrop... they only work from a single point of view. The horizon is always at eye level, so if the tracks are at eye level it is possible to make a convincing sea view for instance... but then you can't photograph from a higher viewpoint. Beautiful work, it looks fantastic! Its fun to paint, another hobby within the hobby although I'm lightyears behind. Nice job on the backdrop. Not easy Martin. First of all by keeping things simple. Distant objects in perspective are less of a problem than close-up. Buildings should be depicted end or side on, not at an angle. Hills, mountains or a row of trees to conceal the horizon. A hedgerow or shrubbery in the foreground will conceal a lot. 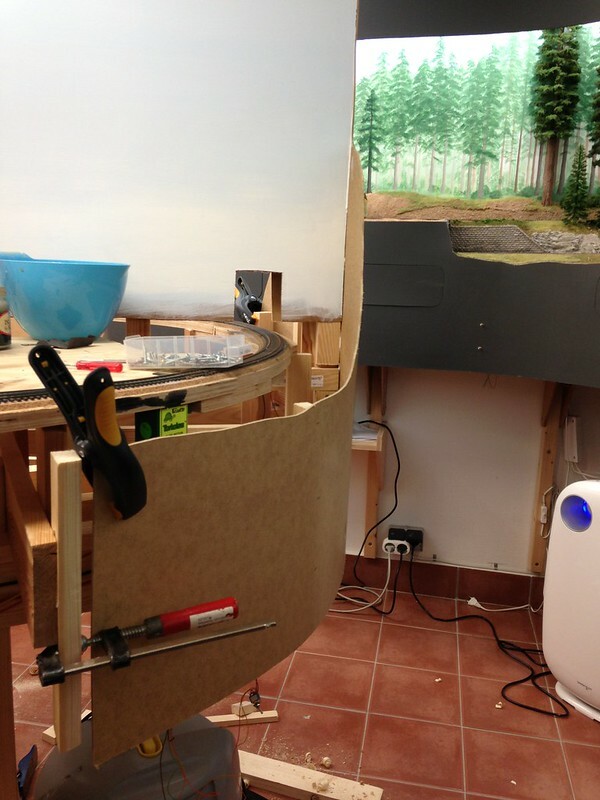 If you have large structures og other scenic dividers on the layout they can be used as "side baffles" to restrict the possibility to view a perspective scene from other angles than the intended. Tall solitary coniferous trees will look terribly slim seen at an angle, while they will melt together better when placed in a group or forest. Thanks Troels for the explanation, I'll keep that in mind when painting. its been quite some time since my last post so I thought I show some progress pictures. 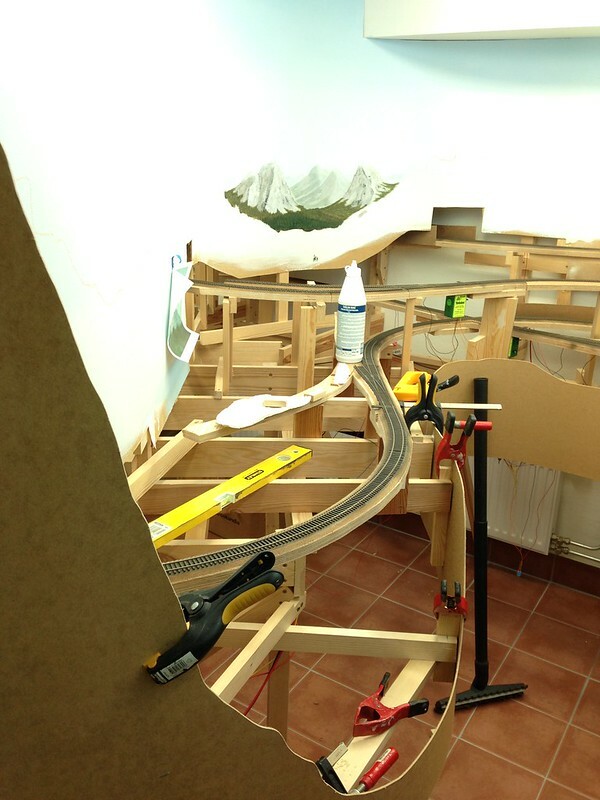 There has been some activity both on the layout and on the workbench. 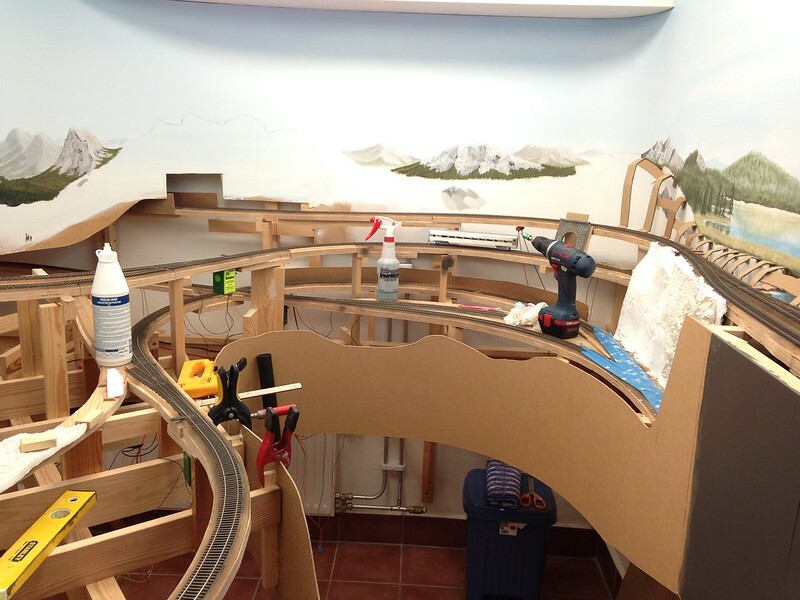 On the layout front I have been working on the background by painting some more mountains. I didn't like what I achieved before so I tried a different approach which I think came out better. 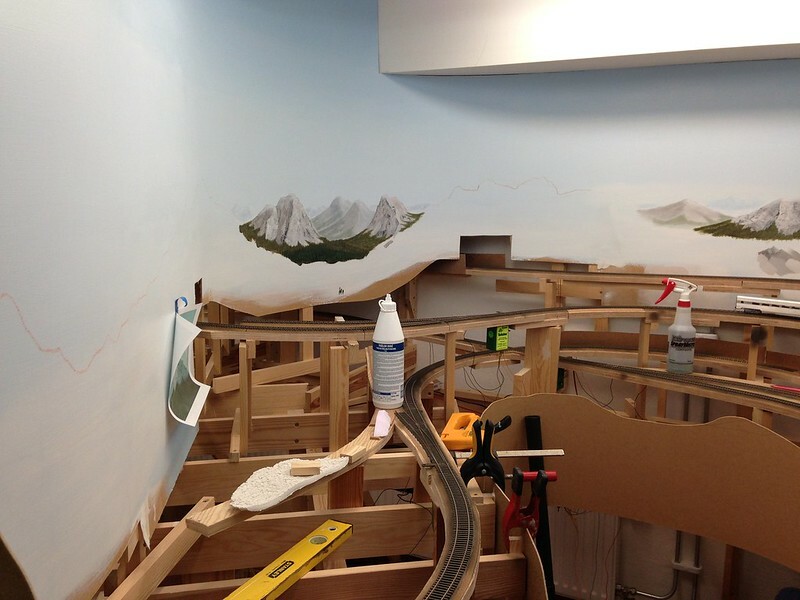 This part of the layout will be more mountainous and with fewer trees (thank goodness!). As there will be more rocks and cliffs and as I'm fed up with the rock molds available from Woodland Scenics I ordered a couple from Bragdon Enterprises (Thanks Cameron for the tip). I must say that I regret that I didn't do that before as the molds make some great looking rocks. The molds also are way more flexible then the WS so it is much easier to apply the plaster castings in situ. They also are quite large so one cover a lot of terrain fairly fast. But before the landscaping begins I'm adding the foredrop as you can see on the pictures below. 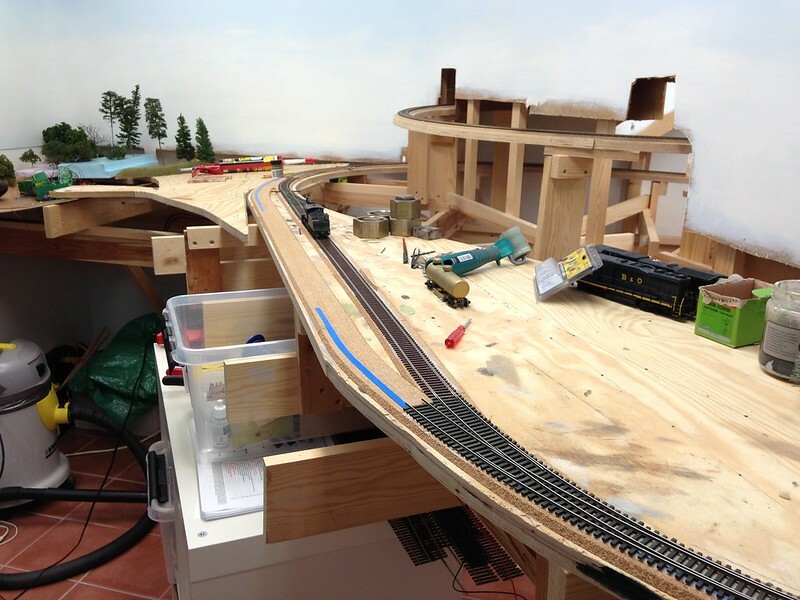 The electrical and trackwork has been an obstacle for some time but now finally I have got the courage up to finish it. The goal is to be able to start on my seaside town of Innsmouth soon as I'm itching to do some maritime modeling. Hi H�kan,nice to see this thread appear,back on page 1 again! And even nicer to see your work continue,as you progress towards the water, at Innsmouth. That will be exciting to see, what you do there!